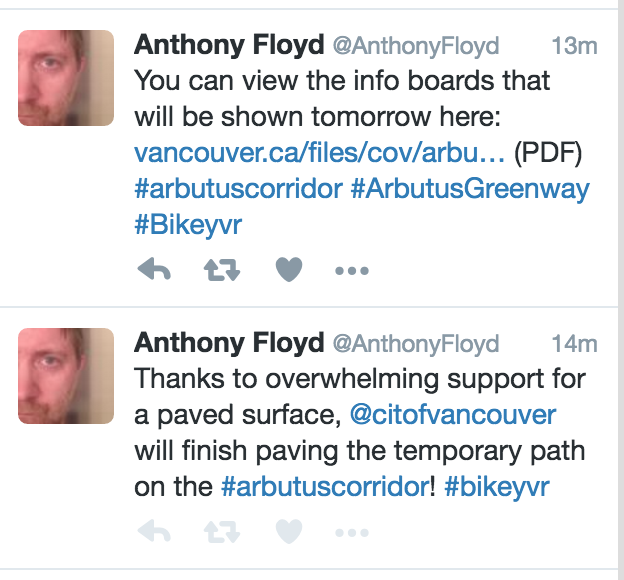 I know that recently I read somewhere about the hopes of preserving the railway heritage of the Arbutus Greenway. It had a lyrical bit about nostalgia for the trains and an old guy painting one of the remaining signals. Of course, I can’t find that now. 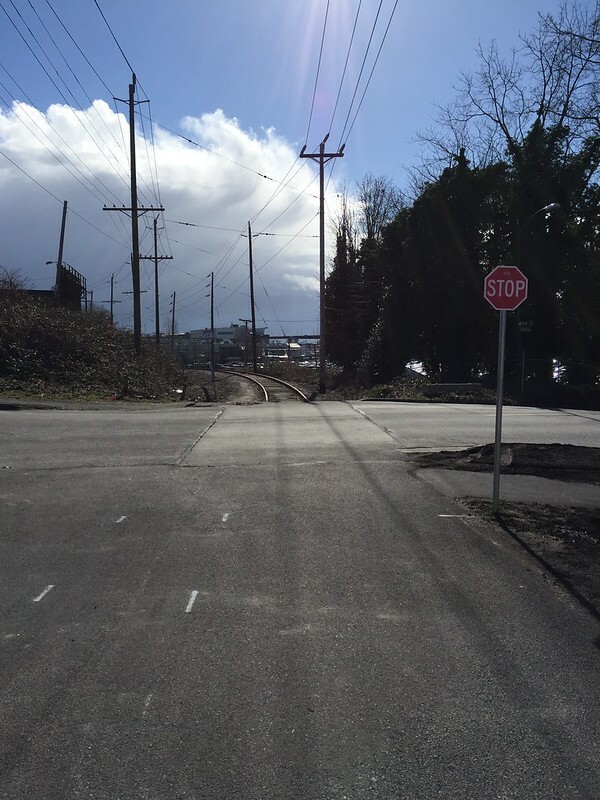 I am quite pleased to see that the signals at 12th Avenue were being removed this morning. I do understand the nostalgia for the way railways used to be, but in this case I think it is more important that redundant equipment and signs out to be taken away. I want drivers to treat railway crossings with the respect they deserve. 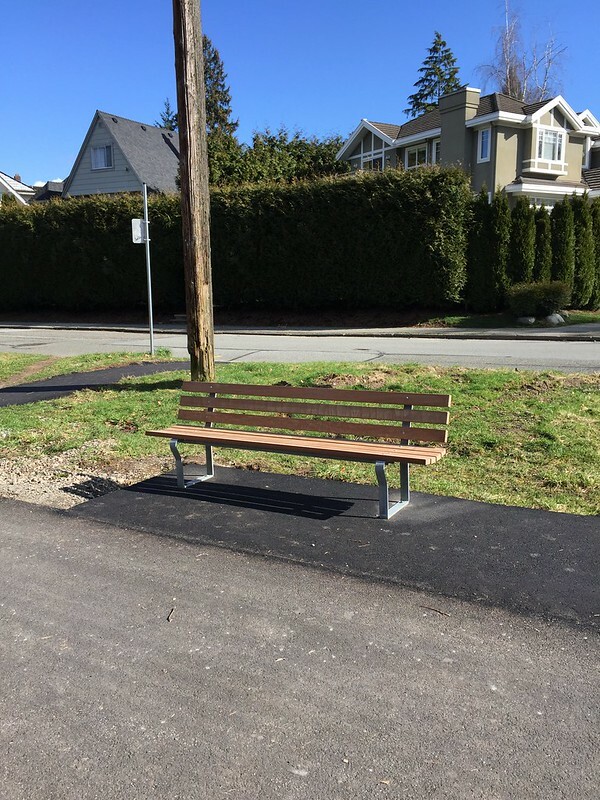 Keeping these signals in place after the tracks were removed simply reduces amount of attention a signal will get by people unfamiliar with the neighbourhood. If they get accustomed to ignoring signals here that might get transferred to other locations where trains operate but infrequently and unpredictably – in other words almost everywhere else in Canada. We walked from Valley to Granville Island today. Since I was on foot there are more photos than the last episode. 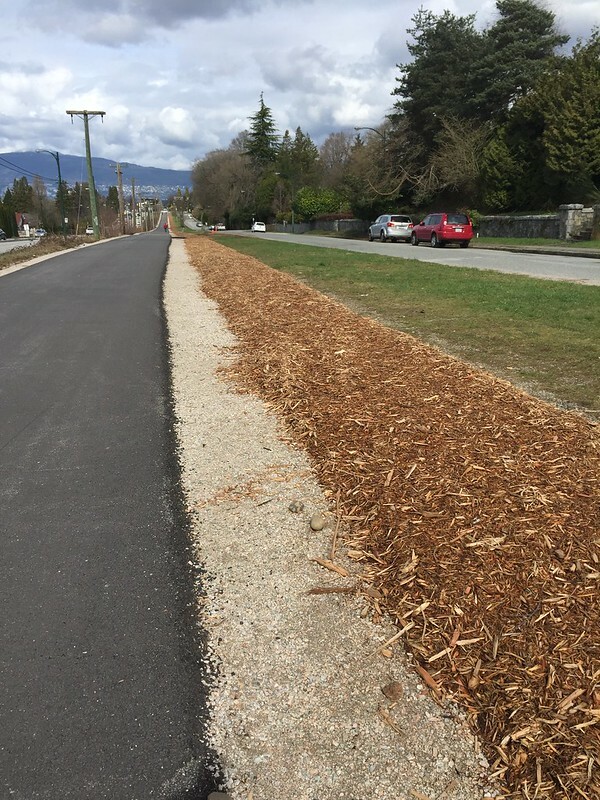 A woodchip trail has now been laid parallel to the blacktop between King Ed and 16th. It would appear that some of the neighbours have needed to adapt a STOP sign to something more needful. The first bike rental station I have seen on the Greenway itself, but I am still not tempted to use them – they are just too pricey. $7 a day – as long as the none of the individual rides is longer than 30 minutes. 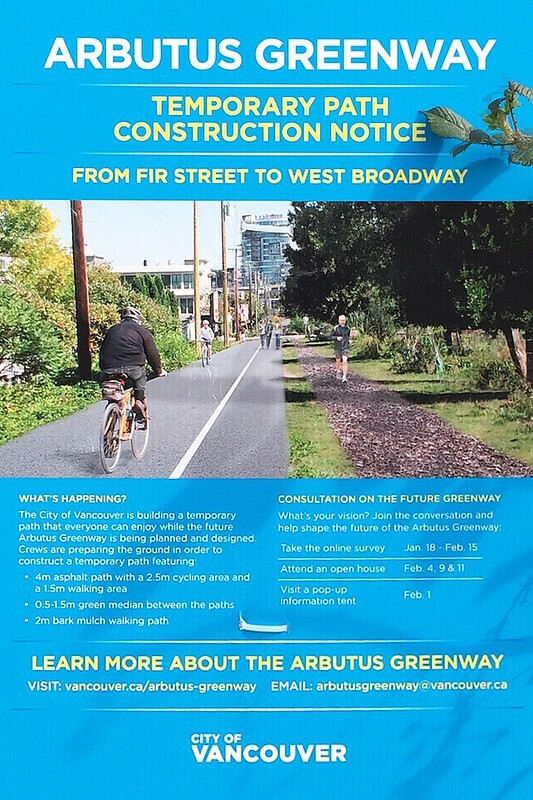 The crossing at 12th seems to be utterly contrary to the City’s stated priorities: cyclists are expected to get off and walk their bike down to Arbutus street and back again. 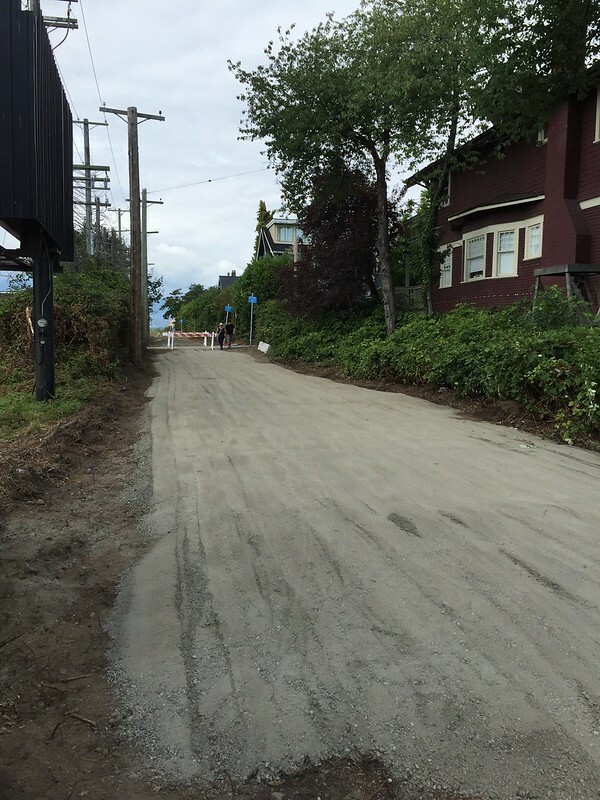 From 10th to Broadway is the only section that has not yet seen any blacktop. I have not taken any pictures of the crossing of Broadway since there isn’t one. There is also no signage. One group of cyclists we saw were riding in circles trying to see what it was they were supposed to be doing. 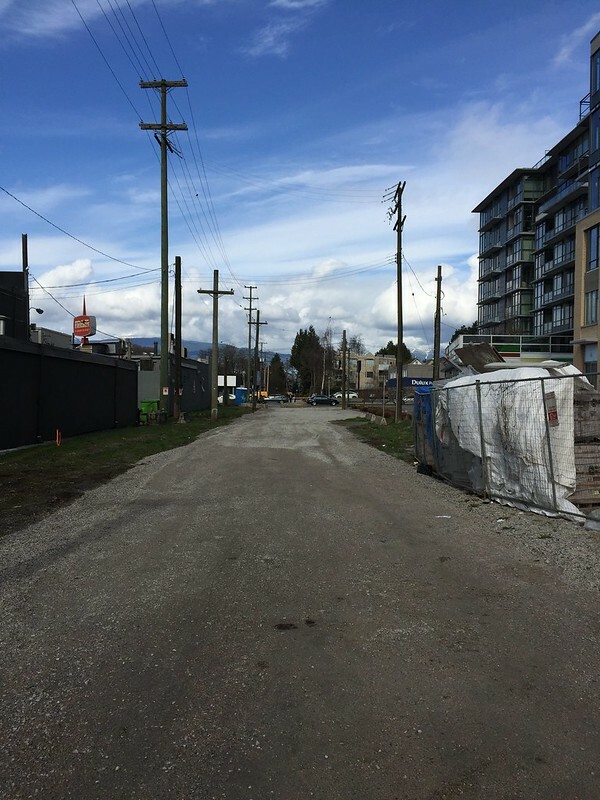 The answer of course is to walk to the existing crosswalk at Arbutus Street. 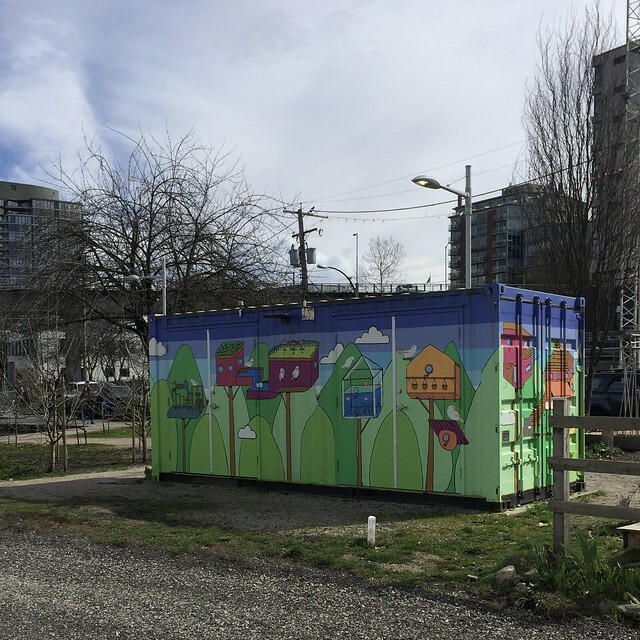 There isn’t any official public art on the Greenway yet but this piece seems worthwhile. This is the City’s poster on the trail – actually almost at the same point where the photo was taken before it was photoshopped to show the chip trail and “divided” blacktop. 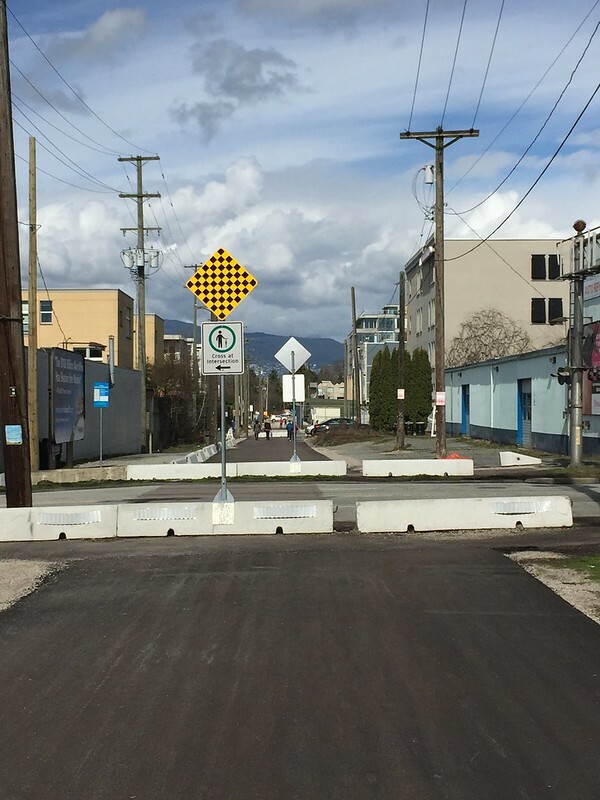 The crossing of Burrard Street is all in place but just not working yet. 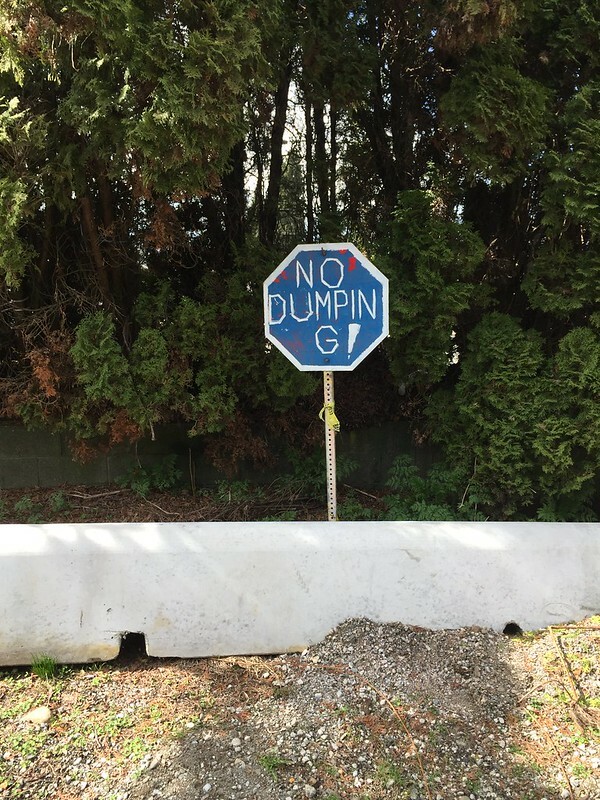 Even so, compliance seems admirable. Down at the Fir Street playground things seem to fizzle out. Like the southern end there is no signage but at least the right of way between 5th and 4th has been kept clear of parked cars, unlike the following sections. 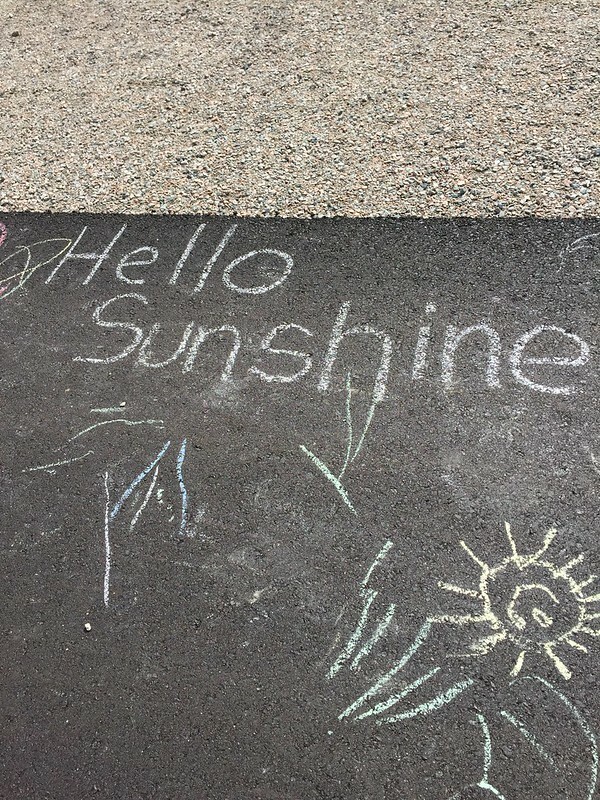 Sunshine – and everyone (it seemed) was out on the greenway this morning. Though the pictures don’t show that. The Greenway ends in one of those no-places – with no connections, or even signs to indicate onward connection. This is Milton Street at Rand Avenue. Note that the Greenway doesn’t appear on Google maps – even as a disused railway. This is the reverse angle looking back up the Greenway. 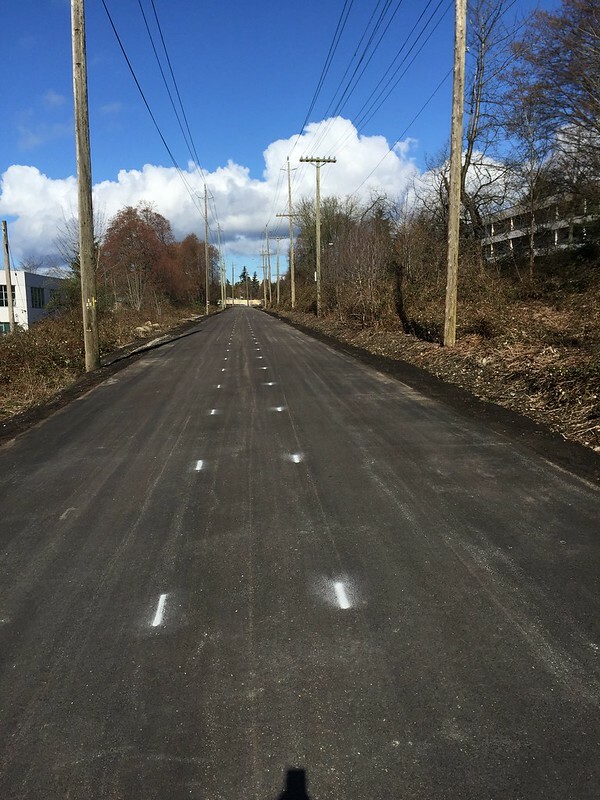 The dashed lines indicate where the blacktop will be removed and replaced by a “landscaped” divider. 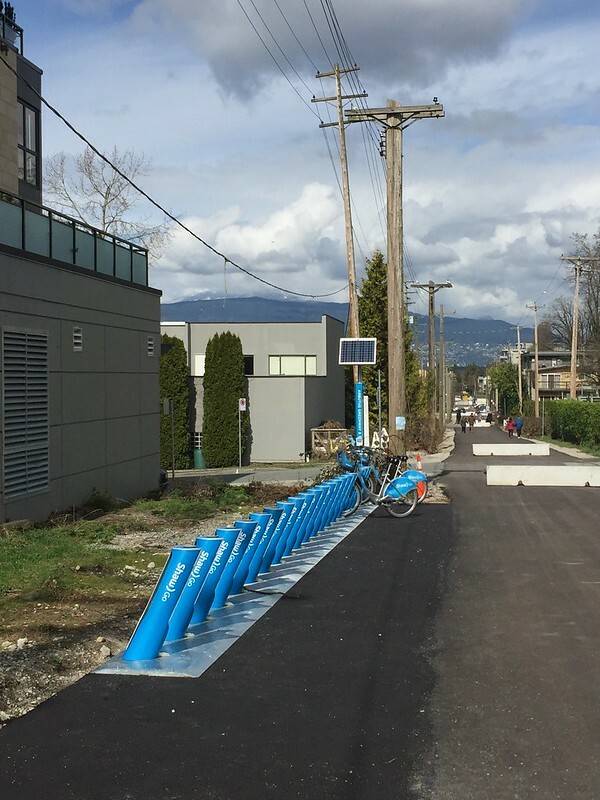 The bike ride is great – but will definitely get better as more separation between pedestrians and cyclists is established. Right now people tend to just keep to the right even where signs and paint on the path indicate otherwise. 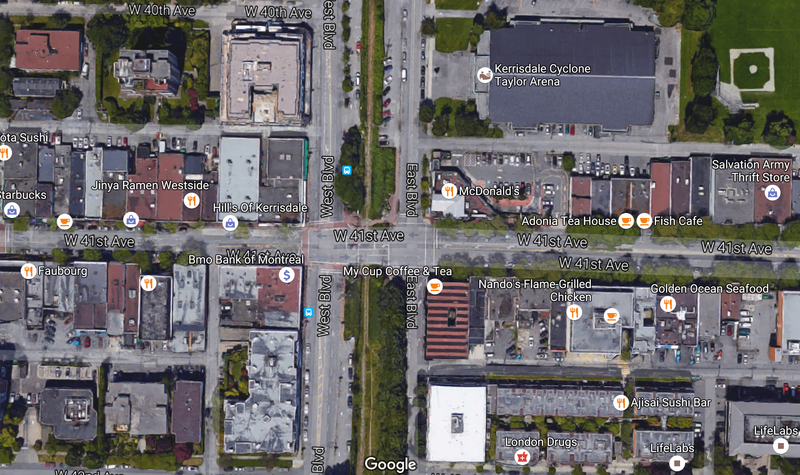 The biggest issue is the street crossings – especially on the busier streets like 41st Avenue and Marine Drive. The old train signals are still place – and what signage there is suggests that cyclists behave like pedestrians. 41st at the Boulevards has long been a vehicle only type of intersection with corrals and blockages to pedestrian desire lines. 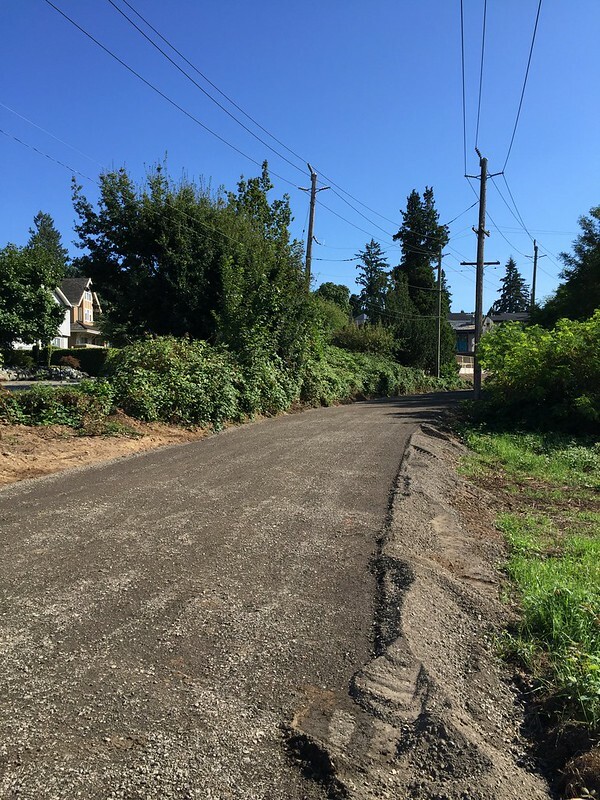 Much work is long overdue here – and the Greenway is going to increase that pressure. But even so it was nice to be out on the bikes again – and enjoying the long sections of gravity assistance!